A savory mixture of aromatic vegetables, garlic and seasonings, and crunchy cooked wild rice make up the filling for this tasty stuffed pork. It is an excellent way to serve lean pork tenderloin. 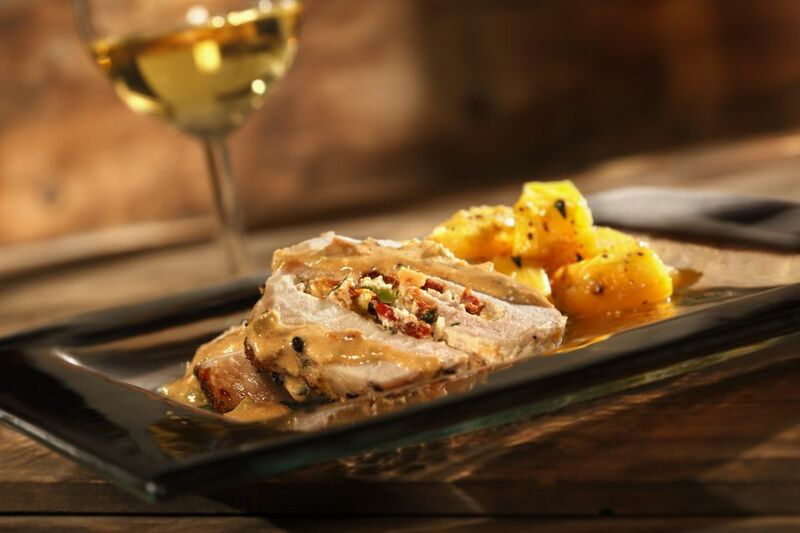 Serve this flavorful stuffed pork with the easy sauce, along with mashed or baked potatoes or steamed vegetables and a salad. Place flour in the cooking bag and shake to coat the interior. Cut the pork tenderloin lengthwise, stopping about 1/2-inch from cutting through. Open the split and flatten the meat out with the smooth side of a meat tenderizer. In a skillet over medium-low heat, saute the onions, celery, carrot, garlic, and thyme in the butter until the vegetables are tender. Add 1 1/2 cups cooked wild rice; stir to combine. Taste and add kosher salt and freshly ground black pepper, as needed. Spread the stuffing mixture over the split flattened pork tenderloin. Fold the meat back over itself and tie with kitchen string to secure. Add the tied tenderloin and chicken broth to the prepared cooking bag; close bag with the provided tie. Place the bag in a shallow baking dish or pan. Bake in the preheated oven for about 1 hour, or until the pork reaches the safe minimum temperature of 145 F (63 C). Pour the chicken broth into a saucepan and skim off excess fat. Combine cornstarch with a few teaspoons of water and stir to dissolve. Stir the cornstarch mixture into the broth and cook, stirring, until thickened. Taste and adjust seasonings with salt and pepper, if necessary. Replace the sauce with ready-made roast pork gravy or pork gravy prepared from a dry mix. Add a tablespoon or two of diced pimiento or roasted red bell pepper to the stuffing mixture for additional color and flavor.